Organisations should be aware of system and data issues before their customers so why not proactively monitor your data in the same way that you might monitor your IT infrastructure? If your data can tell you that a web page is unavailable or a newly launched product is out of stock, why provide a poor user experience and risk dropped sales? If your data can tell you that email addresses are missing or invalid, why wait for a disappointing marketing campaign? Why wait until a downstream system fails to find out that there is a bottleneck in the flow of data through your business systems? Flagship Insight allows organisations to proactively monitor the flow, quality and accuracy of data as it moves through the information infrastructure, identifying anomalies and reporting on the potential impact of those anomalies before they impact the business or customers. Find out how Flagship Insight works with the data that flows through your organisation to provide actionable insights that can increase the efficiency and productivity of your organisation as well as customer satisfaction. Take a look at the features that Flagship Insight offers, such as proactive data monitoring, diagnostic data gathering and tailored email and SMS notifications. Your organisation's data flows are the life blood of your business. Start monitoring them today. Find out more about the real business benefits that proactively monitoring your data can afford your organisation. From reassurance and peace of mind to improved efficiency and increased customer satisfaction and retention. Can Flagship Insight benefit my organisation? Take a look at the following questions. If the answer is ‘yes’ to any of them then Flagship Insight can bring immediate benefits to your organisation. Does your IT teams’ daily routine starts with a series of manual checks to ensure that overnight processes and jobs have executed, data has been loaded and is valid or similar time consuming, repetitive tasks? Is part of your organisation’s day spent running repetitive tasks just to ensure that data is in the ‘right place’ or the ‘right’ format? Is the first time you hear about a system or website problem when a customer or end-user tells you about it? Do you have to wait until a downstream system or process fails to find out that upstream data is missing or invalid? Are you struggling with problems caused by issues in your organisation’s data such as bottlenecks, interface failures or unexpected data values? Control, reassurance and peace of mind. Improved visibility of data issues. Improved productivity and support processes. Reduced time from issue to resolution. How can I achieve those benefits with Flagship Insight? Monitor the flow, quality and accuracy of data throughout the organisation, proactively testing points of failure and sending alerts as soon as issues are identified. Retrieve a complete snapshot of the environment whenever a data anomaly is identified, providing the context of the failure and additional information to support the analysis and resolution of the underlying problem. Translate each data anomaly into the potential effect on the business, sending tailored messages to staff to allow issues to be resolved. Non-technical users can receive an alert message explaining the impact in plain business terms while a detailed, technical message including steps on how to fix potential problems is sent to a technical recipient. Proactively retrieve data required to resolve or mitigate the business impact of a data issue. For example, in a retail environment, sending store sales data to a Merchandising team to support a manual replenishment in the case of a failed overnight replenishment process. Implement and manage a complete support process by taking ownership of failures, then monitoring all unmanaged failures. 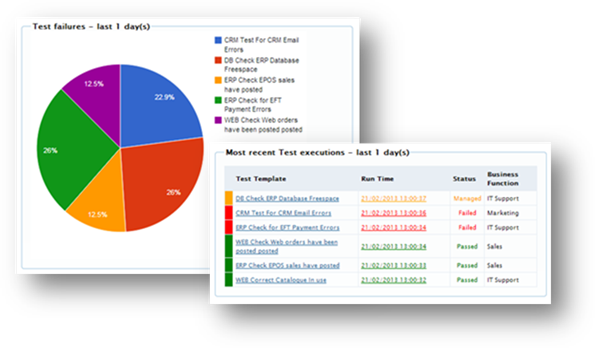 Implement business and support escalation processes for tests that repeatedly fail. Execute a series of tests to perform a system health check.